The guitar amp industry is not one with a lot of competition. While there are lots of people that make amps, you’re basically going to find that what most people buy are from names like Marshall or Peavey. Which makes the way Krank was able to move from relatively obscure to a player with a laundry list of famous fans all the more impressive. Of course, making great products at prices normal mortals can actually afford probably helped. OK, I’ve been finding a ton of user reviews for this amp on the net, and it seems that half of you think that the Krank Revolution+ amplifier is dark, crunchy, and ‘not worthy’. 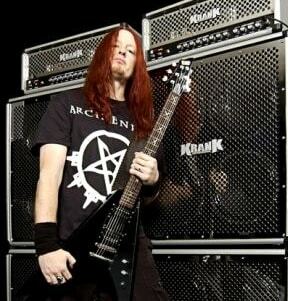 This is a message to that half: if Dimebag heard you say that, he’d probably kick you in the stomach. For the other half, rest assured that this amp is 100% pure metal. Don’t let the emo kids tell you otherwise. Now, let’s get back to what we came here for: information. 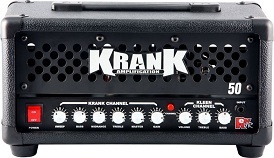 The Krank Revolution+ (from Krank Amplifiers) is an upgraded version of the first-generation Revolution head. The Plus features better transformers, 6550 tubes (power section), and a serious 120-watts of power, making this amp a thing of beauty. Dark, evil beauty.